A casement window is a window that operates by turning a crank that opens the window outside with a screen on the interior of the window (most window screens are on the exterior). A casement window opens vertically; a casement window that opens horizontally is called an awning window. Casement and awning windows are commonly combined with picture windows to create both light and ventilation as well as beauty. In terms of function and purpose, it offers a little something for everyone! Casement windows seal up tighter than any other style of operational window. For areas that need something a little tougher than regular window glass we offer double strength glass, tempered glass, or laminated glass as an option on all of our casement windows. Casement windows can be made of wood, vinyl, steel, aluminum, fiberglass, or composite. Most picture windows sold today are vinyl or wood (with vinyl being the most popular.) and the glass paneling can come as double pane or triple pane; with argon gas, krypton gas, or no gas. There are a number of different types of Low-E coatings available which can greatly increase the efficiency of the window. Casement windows come in a wide variety of colors both interior and exterior (with white or beige being the most popular.) and exterior colors in various shades of brown, green, tan, red bronze, etc are available from many manufacturers. Interior color and wood grain laminates are also available. For and extra special touch, these windows can also come with a wide range of grids/grills between the panes of glass; anything from flat, colonial, contour, diamond, prairie, or double prairie. Etched grids and simulated divided lites are also available as well as mini-blinds between the glass. For those who like the finer things, specialty glass is available with such items as stained glass, art glass, etched glass, brass or lead caming, etc can be incorporated into your window. Call today for you free estimate and see just what these beautiful functional windows can add to your home! 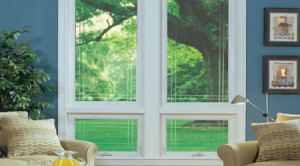 Energy View offers Casement Windows for your next home improvement or new construction project. Call Now for a free estimate! (314) 656-1410.